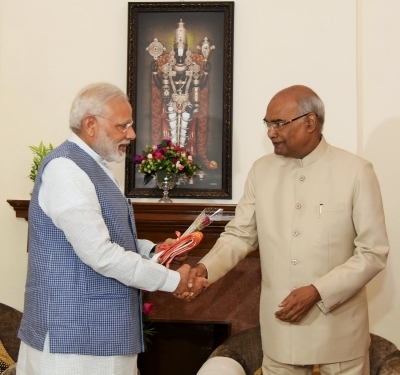 New Delhi, July 20 (IANS) Prime Minister Narendra Modi on Thursday called on President-elect Ram Nath Kovind and greeted him after his victory in the Presidential election. Modi was accompanied by BJP President Amit Shah and Union Minister Ananthkumar. The Prime Minister handed a red rose and an ‘angvastra’ to Kovind, apart from offering him sweets. 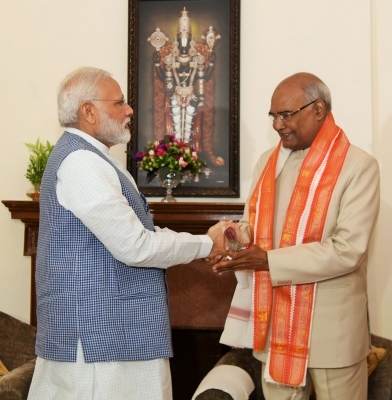 Earlier, Modi shared two pictures of him with Kovind’s family members, captioned “20 years ago and the present… always been a privilege to know you, President-elect”. National Democratic Alliance candidate Kovind was elected the President of India by securing 65.65 per cent of the total valid votes, compared to opposition nominee Meira Kumar’s 34.35 per cent.